If this is your first time opening Presave+ it will take you to the ‘Edit Presave+ Profile’ page. Here you will choose the playlist/collection name, this is the name of the playlist that all your releases will appear in inside your fans chosen DSP. The next 3 steps are to setup your Presave Subscription page. This is a page that fans can come and subscribe to all your releases without specifically presaving a release. There are two ways to add a song to presave+ – it’s important to note here that if songs are not added into PS+ before someone presaves a song, they will not receive all your future releases. It needs to be in place before they do. If you have questions about PS+, feel free to reach us through our support chat or at support@presave.io. 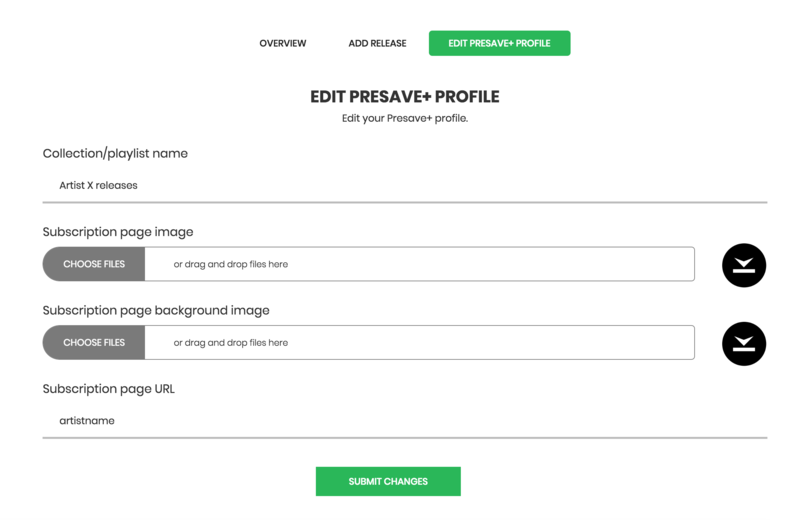 Presave is a revolutionairy automated tool that allows anyone to create their very own Presave campaign. For more information or assistance, please contact support@presave.io. Copyright © Presave 2017–2018. All rights reserved.